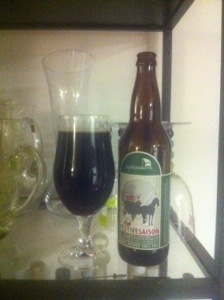 My twelve beers of Christmas, number 3, Spinnakers Brewing Festive Saison: Black Saison with Ginger. This beer has a very complex nose that I honestly cannot parse. There are obviously notes of ginger and ther are some sour fruit esters but there are other things going on that I cannot put my finger on. Sadly the flavour does not live up to the nose. The sourness that is definitive of a saison is very weak and comes off as very metallic, I think because of the ginger. The flavour is muddled at best, weak at worst. The ginger itself gets lost in the metal taste. The carbonation is good, pleasantly effervescent. Not a favorite, which is sad, I generally like Spinnakers. This entry was posted in Saison and tagged bc, black saison, canada, festive saison, ginger, metal, mild flavour, spinnakers, victoria.